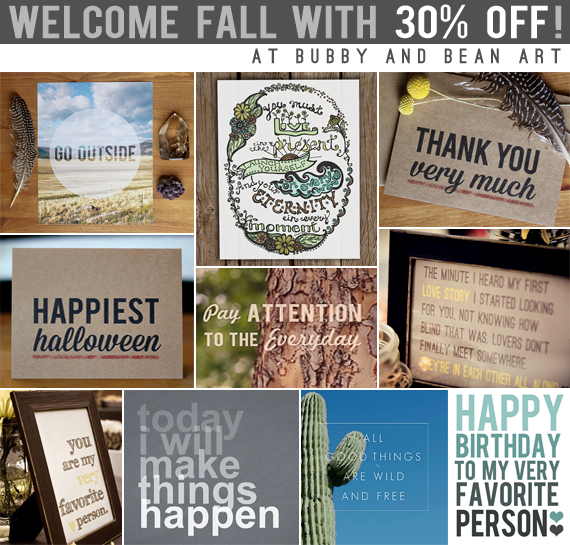 Bubby and Bean ::: Living Creatively: Welcoming Fall With Some Major Discount Love! Welcoming Fall With Some Major Discount Love! Today we're sending out our big fall newsletter over at my sustainable fashion line Mountains of the Moon, and I wanted to be sure to share the major discount that we included! 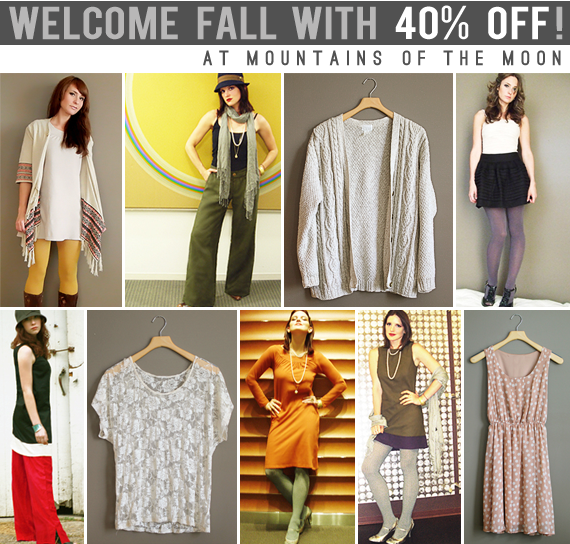 To welcome the new season, we're offering 40% off all clothing items with code FALL2013. Yep, 40%. This includes our eco-fashion line, vintage and gently worn clothing, clearance clothing items - all of it. This special coupon starts today and ends on Monday, September 23rd. Annnnd... we're sharing the autumn love over at Bubby and Bean Art too! Today through Monday, take 30% off your entire order with the same coupon code, FALL2013. Thank you guys - so much - for your continued support of our businesses. It means a lot to me when I hear that blog readers are fans of our shops and vice versa. Three cheers for small and independent companies! *Coupon codes are valid through 09/23/2013 only. May not be used toward the purchase of gift certificates, or combined with payments made with gift certificates, store credits, or other coupons. Coupons cannot be applied after purchases have already been made. Thanks so much for your support Anna! Love the "Go Outside" artwork!